For over 15 years, we have been the place to find unique, quality antique and vintage items. In January 2018, we expanded with a new 46,000 square foot facility to accommodate our 100+ Dealers. 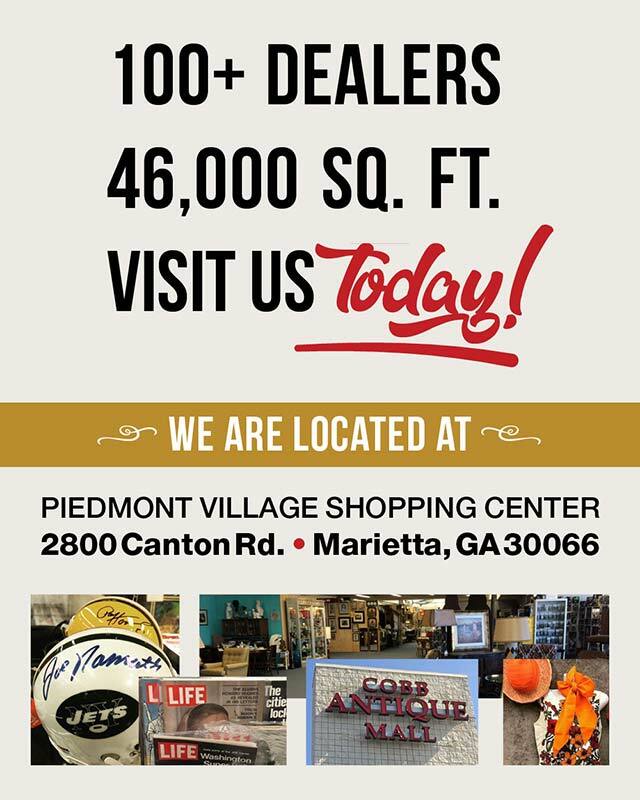 Visit today and see why everyone in metro Atlanta loves to shop at Cobb Antique Mall. Discover a wide array of primitive, traditional and mid-century modern antiques and art deco, and preserve your finds with our custom framing options. Continue your special collections by shopping our coins, sports memorabilia, comic books, vinyl albums, costume and fine jewelry and more. Treasure our vintage clothing, depression glassware, quilts and linens, vintage signs, retro furniture and many other great hallmark keepsakes. Come to our annual clearance sale. It only happens once a year. Savings up to 50% off on select items. Many booth wide sales. You do not want to miss this event!!! Saturday 10:00a.m. – 7:00p.m. Sunday 12:00-6:00p.m. Great two day event Coins (gold, silver, proof sets), sports cards and collectibles, military memorabilia, vintage toys, Barbies, G.I. Joes, vinyl records, crystal, jewelry, comics, Avon collectibles, vintage advertising, Pokémon, Magic, pop figures, and so much more! Saturday 10:00a.m. – 5:00p.m. Sunday 12:00 – 6:00 p.m.
You can see who we've worked with near you that you might know for a reference by browsing our hierarchical portfolio directory below. For antiques and vintage furniture, cities we serve include Acworth, Austell, Fair Oaks, Kennesaw, Lithia Springs, Mableton, Marietta, Powder Springs, Roswell, Sandy Springs, Smyrna, Vinings, and Woodstock.